Heat the oven to 375°F. Lightly grease a baking sheet. Beat the egg and water in a small bowl with a fork. Unfold the pastry sheet on a lightly floured surface. Roll the pastry sheet into a 15x10-inch rectangle. Cut in half lengthwise. Cut 1 pastry half into 4 (5 x 3 3/4-inch) rectangles. Repeat with the remaining pastry half. Place the pastries on the baking sheet. Brush with the egg mixture. Bake for 15 minutes or until the pastries are golden brown. Remove the pastries from the baking sheet and let cool on a wire rack for 10 minutes. Split each pastry into 2 halves, making 16 in all. Heat the butter in a 10-inch skillet over medium heat. Add the apples, brown sugar and cinnamon and cook and stir for 10 minutes or until the apples are tender. Remove the skillet from the heat. Spoon about 1/2 cup apple mixture on each bottom pastry layer. Top each with about 1 tablespoon caramel topping and 1 tablespoon pecans. 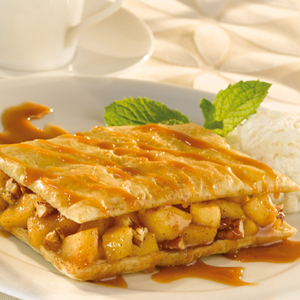 Top with the top pastry layers and drizzle with any remaining caramel topping. Serve with the ice cream. Make-Ahead: Bake the pastry rectangles and cook the apple mixture up to 24 hours in advance. Reheat the pastries for 10 minutes in a 300°F. oven or until crisp. Cool and split as directed above. Reheat the apple mixture in a microwavable container on HIGH for 2 minutes or until hot, stirring once halfway through the cook time.